U. F. Grant was one of the world’s most prolific magic inventors, inventing over a 1000 tricks during his lifetime. 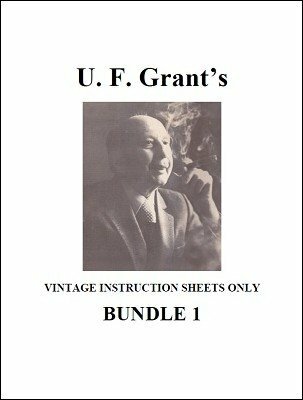 This bundle contains 10 of his vintage instructions sheets. Some of these instructions are near impossible to find today. The instructions have not been redone; but, rather, these are scans of the original directions that Grant sent with each trick. All scans are readable. An educational look into the mind of U. F. Grant. Some of the tricks can be easily made after reading the instruction sheets.